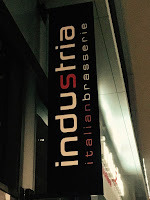 Nestled in the heart of the new culinary mecca that we call Landsdowne, Industria Italian Brasserie recently opened its door to Ottawans this past August. 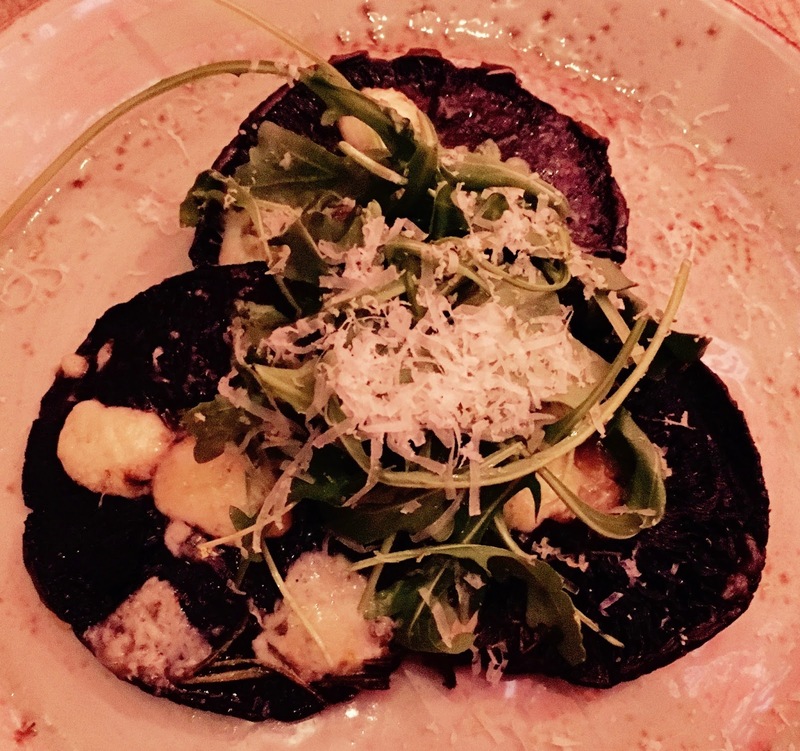 Tempted by its fusion of authentic and modern Italian cuisine, we headed there for a pre-Christmas celebratory dinner. As we first walked in, we were instantly impressed by the brasserie's elaborate, yet tasteful decor, high ceilings adorned with glass bubble lighting and statement art pieces throughout. 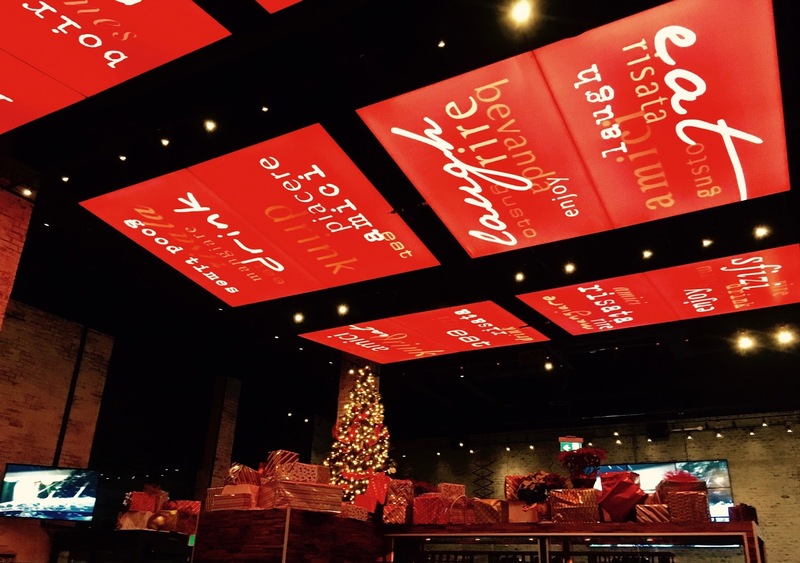 The restaurant felt very trendy and chic, but welcoming at the same time. There was also an abundance of seating, with both regular and hightop butcher-block tables, booths and a large bar. We managed to snag a great spot at a booth near the back. The moment we sat down, we were immediately drawn to a sign on the table promoting ‘4 & 7’. We quickly discovered that between 4:00pm and 7:00pm from Monday to Friday, all drinks are $4 and all small bites (sfizi) are $7. It was 6:58pm. We frantically called over the waiter to place an order before 7:00pm. Success! In less than 2 minutes, we were able to order some drinks and a few different appetizers to start. Our waiter was more than willing to get grant us the promotion and he even recommended that we double-fist! Looking back now, we differently should have triple- or quadruple-fisted! In our mad ordering dash, we went with the Roasted Portobello Mushrooms (regular price $9), the Beet Salad (regular price $12) and the Semolina Fried Calamari (regular price $12). Considering the clock was ticking, we made some very good choices. 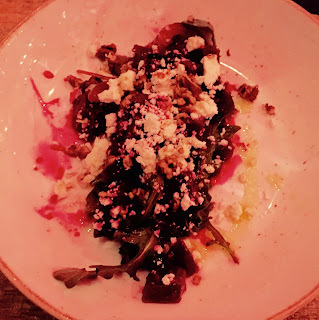 The Mushrooms, which were stuffed with garlic, gorgonzola, sherry, vinegar and lemon zest, were tasty and flavourful, while the Beet Salad topped with grilled onions, goat cheese, candied walnuts and arugula, was a heavenly delight. 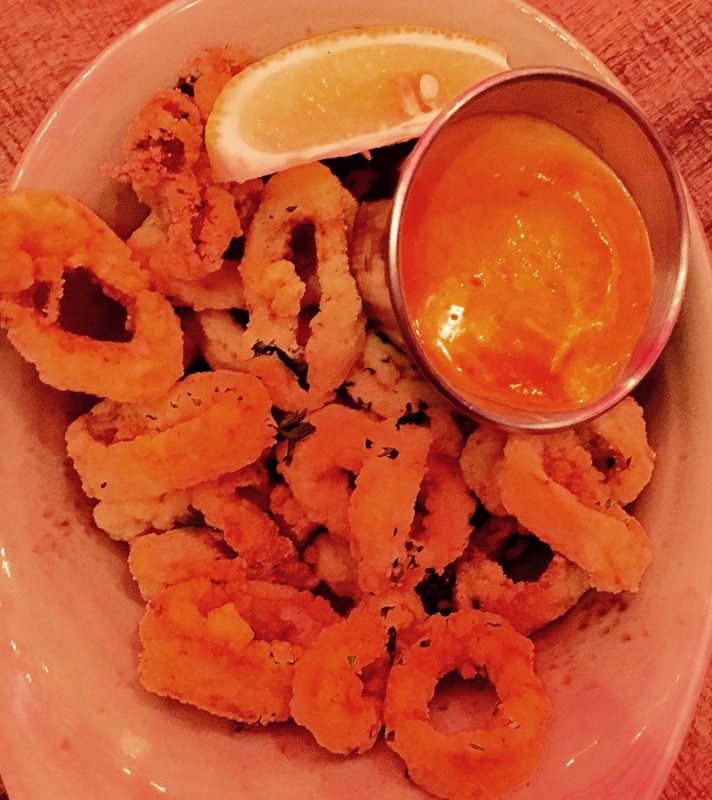 The Calamari was equally delicious and was paired perfectly with smoked peperoncino mayo. For our main courses, we went with classic Italian staples: pasta and pizza. 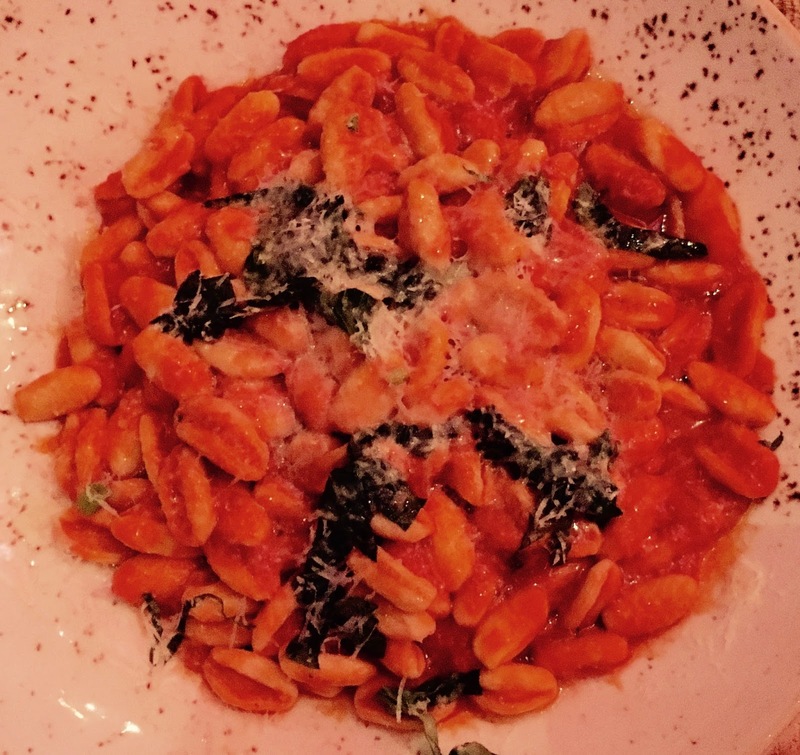 I ordered the Cavatelli Pomodoro ($15), which consisted of cavatelli pasta, fresh tomato sauce, basil and parmesan. It sounded simple, yet tasty. Unfortunately, I was somewhat disappointed by my dish. The sauce was actually too simple and lacked any real flavour. 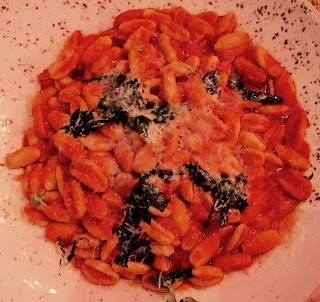 The cavatelli was also served el dente and was too hard for my liking. However, my dining companions definitely made the right choices. 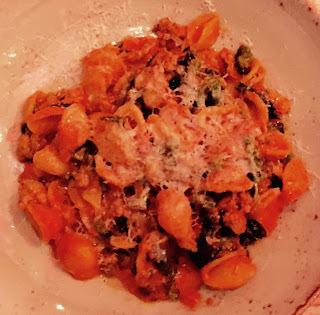 My fellow pasta lover got the Orecchiette Salsiccia E Rapini ($17), a bowl of fresh orecchiette pasta topped with Italian sausage, rapini, tomato sauce and parmesan. Though a bit rich, the orecchiette was cooked perfectly and the chunks of spicy sausage were delicious! 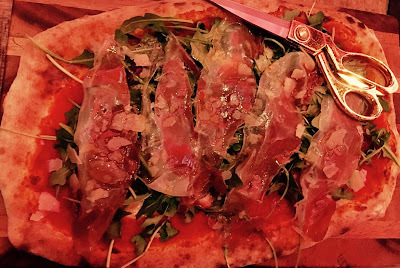 However, the pièce de résistance of the night was the Prosciutto E Rucola Pizza ($20). 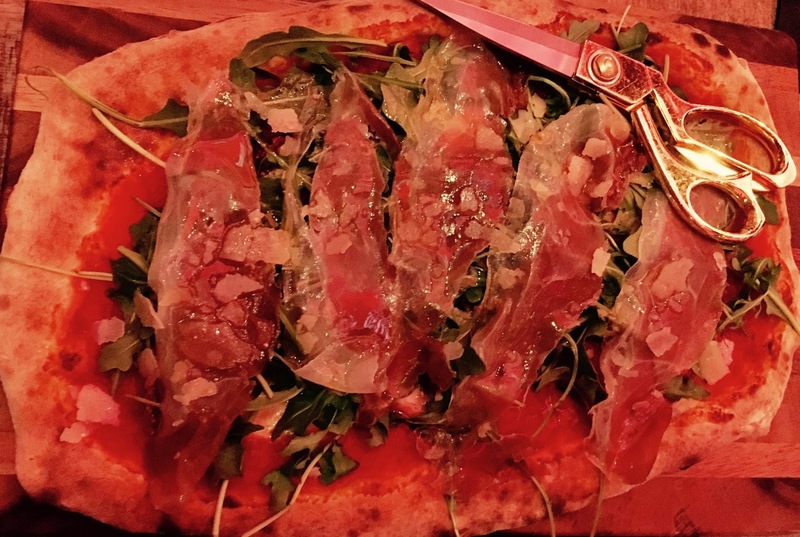 Served on a board with cutting shears, the pizza was topped with prosciutto, fresh arugula, sundried cherry tomatoes, parmesan shavings, truffle oil, tomato sauce and fresh mozzarella. The toppings were fresh and of the highest quality and the pizza itself was perfectly seasoned. The chewy crust was also simply magnificent. 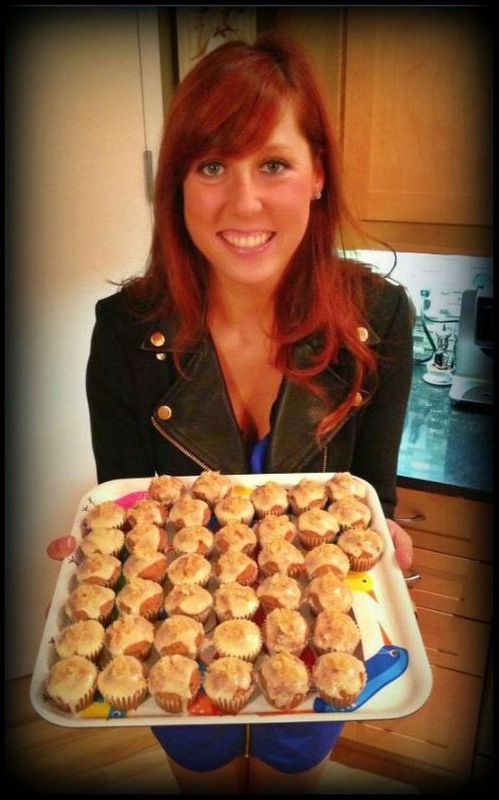 Their desserts were from the predictable school of Italian sweets, as in tiramisu, bread pudding and Nutella pizza. The Nutella pizza looked ridiculously sweet and decadent, but would probably be a great treat to share amongst a big group. Unfortunately, we were too full to indulge and opted against dessert...which was a good call since we were treated to a mug of mini Amaretti cookies with our bill! Overall, we had a great experience at Industria. The restaurant was very hip, the servers were super friendly, and the food was scrumptious (with lots of selection). I actually recommend that you peruse their online menu in advance and take a look at the pictures of all of the dishes. We will definitely be returning to Industria again, but next time we will arrive well before 7:00pm to take advantage of the 4 & 7 promotion! Also, for you late eaters, they have another promotion called AFTER 10. Every night after 10 p.m., you can order any pizza and one beer for only $15! Now that's another great deal! 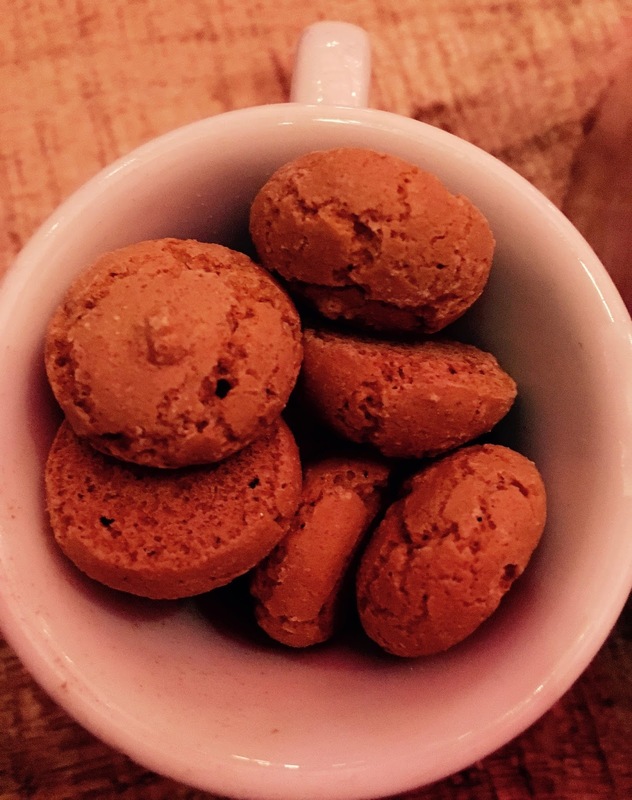 Anyways, be sure to check it out...you won't be disappointed (just steer clear of the Cavatelli)!